A new simpler and less risky way of screening children and adults for peanut allergies has been found by a group of Australian researchers. This new blood test offers a less invasive and more accurate test than existing methods. The Australian researchers have shown in a study, that a twin-element blood test can be used to test and reliably confirm allergies to peanut instead of putting children through risky Oral Food Challenge (OFC) tests. 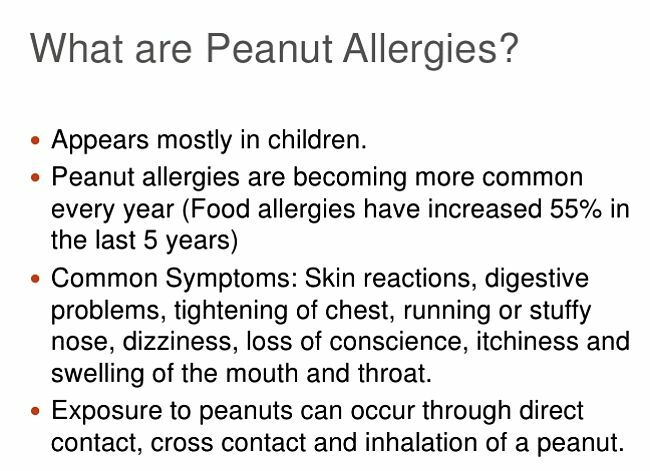 These challenge tests of reactions to peanuts can be risky, expensive and dangerous due to the risks of severe reactions, like anaphylaxis ( see below). There are long delays for suspected cases to be confirmed. For example in Melbourne, Australia, the waiting list for the oral food challenge test more than 12 months. Many parents concerned about likely allergies have resorted to going to the carpark of local hospitals and feeding their children peanuts, so they could head straight to the emergency department if they had an adverse reaction. This is an intolerable situation. The new testing processed that involve a simple blood test can be used to screen children for a peanut allergies and offer parents a get peace of mind. Dealing with the risk of peanut allergies in schools is a major problem every school must face. Recent research has confirmed that early exposure of infants to peanuts stops the development of allergies in children with high risk of developing it. Children exposed to peanuts in the first year of life, and during their first five years did not deelop peanut allergies even after not eating peanuts for 12-month months. The researchers claimed that part of the problem was a "culture of food fear" that became a self-fulfilling prophesy. When susceptible children have foods such as peanuts excluded from their diets, the children fail to develop a tolerance. The detection of the peanut-specific antibogy IgE (sIgE) in the blood is often used to confirm a reaction or sensitization to peanuts patients, but this does not reliably predict an allergy. The new test is for Ara h 2 which is the major peanut allergen found in more than 90% of patients with peanut allergy, and offers greatly improve diagnosis. 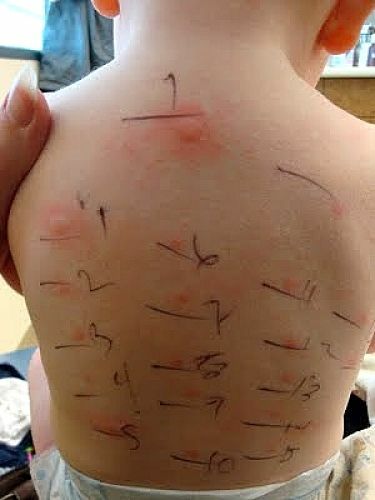 Children from the population-based HealthNuts study in Australia were given skin prick tests to assess their sensitization to peanut. These children were subsequently given an Oral Food Challenge (OFC) test to peanut to confirm allergy status. A randomly selected group of 200 infants (100 with peanut tolerance and 100 with peanut allergy), had blood samples taken. 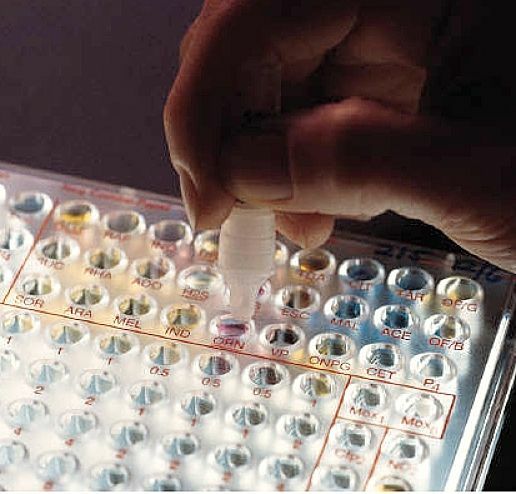 Whole peanut sIgE and tests of the levels of Ara h 2 sIgE in blood samples were measured using fluorescence enzyme immunoassay. The study found that the dual test correctly identified 60% of subjects with true peanut allergy compared with only about 25% that were identified using whole peanut sIgE test. The research study concluded that the twin tests of plasma sIgE and Ara h 2 levels in the blood for peanut allergy could potentially reduce the number of OFC test required by as much as 60%. If the blood contains Arah2, this is adequate to confirm an allergy to peanut and no further OFC testing is required. The Ara h 2 plasma sIgE test should be considered as a new diagnostic tool for screening children for the allergy and for confirming suspected cases. This method could reduce the potential over-diagnosis of peanut allergies by concerned parents and cut the number of people referred to specialists for further testing. The test is ideal for screening children who are at high risk of food allergies, like those with eczema and with relatives who have food allergies. Peanut is the most prevalent allergy to nuts - affecting about 3 per cent of Australian children under the age of two. Peanut allergy is a severe, and sometimes fatal response that is triggered following exposure to peanuts or peanut products, usually by ingestion. It is caused by the IgE allergy antibodies developed in the body against peanut proteins. In Western countries, surveys have shown that about 0.5% of children (about 1 child in every 200) develop allergic reactions to peanuts by the age of 5 years. Overall about 1-2% of the general population (all ages) have a clinical reaction to peanuts. While 3% of all children show a positive response to a simple test such a skin prick, only about one third of these will have major allergic responses to eating peanuts. The incidence of peanut allergies in children differs markedly in various countries. Australia has a relatively high prevalence of peanut allergy, for unknown reasons. 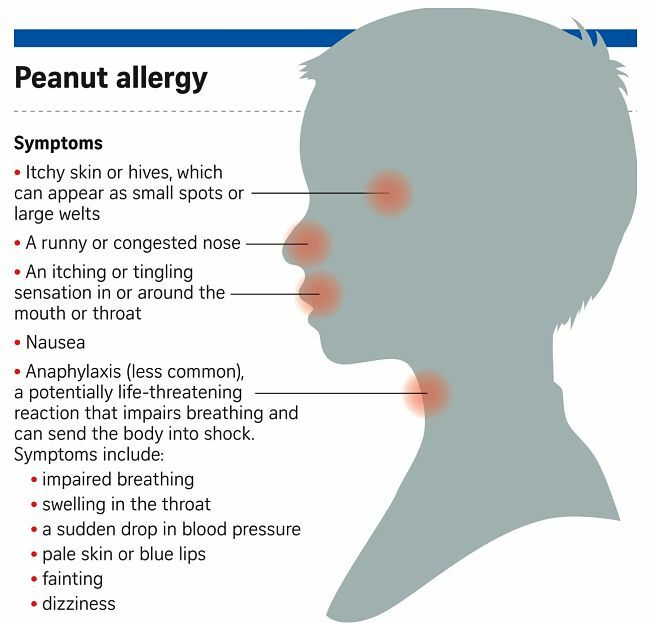 Most of the allergic reactions to peanut are relatively small and may cause hives or inflammation around the mouth or on other parts of the body. Other common reactions are vomiting and abdominal pains that develops soon after eating peanuts or various peanut product. Some sensitive children can develop wheezing, coughing, difficulty breathing or hoarseness of the voice. In the worst cases people may collapse and lose consciousness can occur. Rarely particularly sensitive people have died from the severe allergic response to peanut products known as Anaphylaxis, which is the most severe form of allergic reaction. 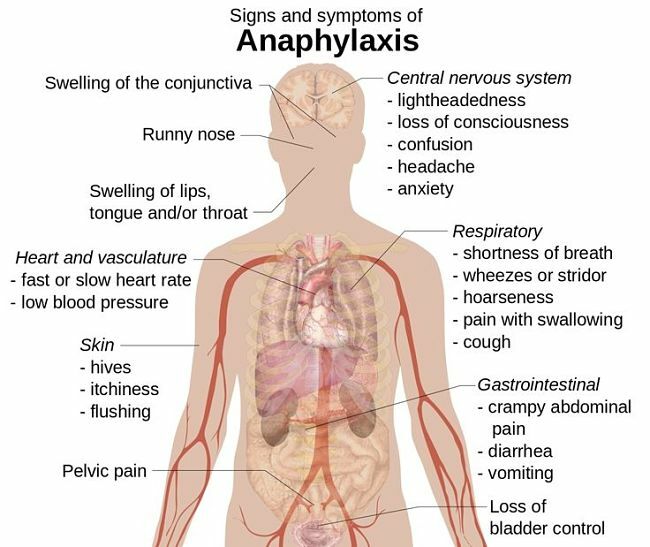 Anaphylaxis is serious and must be treated as a medical emergency, requiring urgent treatment, mostly using adrenalin injections, and urgent follow-up medical attention. Anaphylaxis is a general allergic reaction to other things such as bee stings, which often involves more than one body system (e.g. skin, gastro-intestinaln respiratory and the cardiovascular system). Such a severe reaction can be triggered within 20 -120 minutes after exposure and can rapidly become life threatening. In some people even tiny quantities of food can trigger a life-threatening reaction. Parents of children with allergy risks should always be very careful to get detailed information from their doctor about any drug that is prescribed for them. Anaphylaxis is very dangerous, but is preventable and treatable if detected early and the response is quick, informed and appropriate. Knowing what is likely to trigger the reaction is the first step in prevention. 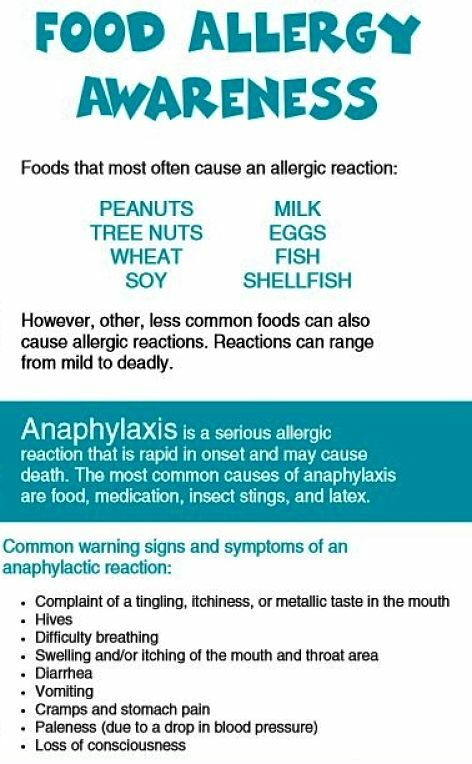 Children and their caregivers, friends, relations and social contact groups need to be aware of how to avoid food allergens and/or other likely triggers forAnaphylaxis. However, because accidental exposure is a reality, children and caregivers need to be able to recognise symptoms of an anaphylaxis attack and be well prepared and educated to help administer adrenaline according to the individual's urgent needs. Action plans for anaphylaxis have been developed for most schools, child care centres and work environments and people need to be aware of these plans and understand what to do. This usually involves the availability of adrenaline auto-injectors, that provide intra-muscular injection of a single, pre-measured dose of adrenaline that is given for the emergency treatment of anaphylactic reactions. People everywhere should undergo awareness exposure and training about the use of these devices and how to recognise Anaphylaxis reactions. How do I avoid exposing my child to peanuts? Peanuts are found in many foods and commercial products often unexpectedly. It pays to know where to look. It is also important to use common sense and to read food labels very carefully. Peanut oil - cold pressed, expressed, or expelled (note - Arachis oil is peanut oil). Note: Highly refined peanut oil is unlikely to cause a reaction in those with a peanut allergy, but it pays to be very cautious. 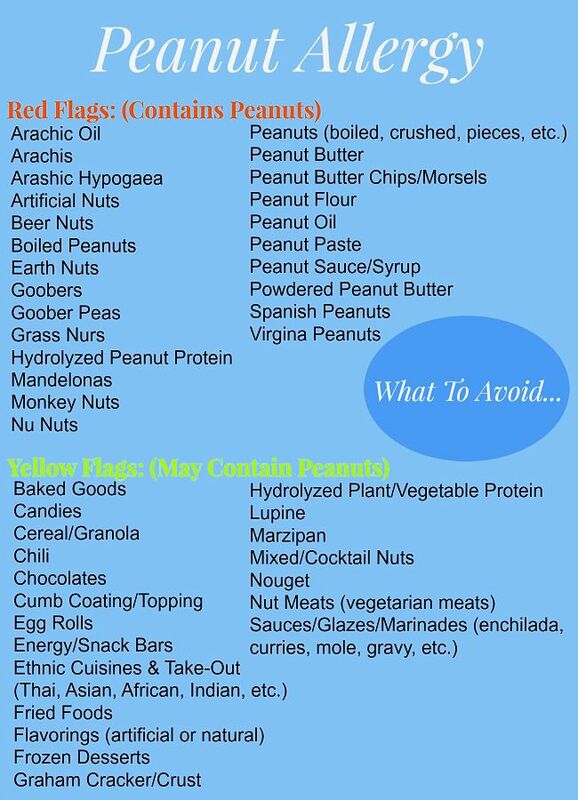 All peanut products e.g. peanut butter. Crushed / ground peanut - in sauces or coating on food (cakes, buns, ice-cream), satay sauce, peanut sauce. Is peanut oil a risk? - The problem with peanut allergy is the protein but not the oil (fat) in the peanut. In small studies refined peanut oils have been shown to be safe. Cold pressed peanut oil does contain peanut protein and should be avoided. Unfortunately it is often difficult to guarantee that the oil is sufficiently refined to remove all traces of peanut protein. Avoidance of peanut oil is often advised particularly for people who have had the more severe life threatening reactions. What is an EpiPen? - An EpiPen is an emergency device which injects a dose of adrenaline into the muscle just under the skin. It is used as an emergency on-site treatment for severe reactions to peanut and other allergies. The drug adrenaline reverses the severe allergic reaction and can save lives that could be lost before emergency medical teams arrive. Ananen is another brand of automatic adrenaline injector. Should my child carry an EpiPen or similar Device? - Virtually all allergists agree that children who have had a serious reaction to peanut with involvement of the breathing passages should have an EpiPen. The need for other children to have an Epipen depends on a number of factors which should be discussed with your doctor. If you have an EpiPen it is very important that you understand how to use it and that you have a written Anaphylaxis Action Plan provided by your doctor. What to do about foods with a label that says "may contain traces of peanuts"? - Many foods carry a warning on the label "may contain traces of peanuts". This usually indicates that the food is made in a facility that also makes a food containing peanuts, however the food product itself may not contain peanut and it will not be listed as an ingredient. The best advice is to discuss what to do about these foods with your doctor as it depends on the likely severity of the allergy. Does my child need to avoid other types of nuts? - Often children may have a reaction to a number of different types of nuts. Different nuts are usually checked when doing skin prick tests for allergies. Your doctor may advise your child to avoid all types of nuts depending on your child's test results, type of reaction and family history. It is important to discuss this with your doctor. Contamination may occur within processing plants where different types of nuts are processed. Avoidance of all nuts is usually the safest line of action. Can my child grow out of peanut allergy? - In most children (80%) with peanut allergy under 5 years of age, the allergy will continue into later childhood. However 20% of children do grow out of their allergy. Those children who have had more severe allergic reactions with breathing problems are much less likely to outgrow their allergy than children with milder reactions. Your doctor can sometimes determine whether the peanut allergy is still present by monitoring the allergy tests every 12 months or so. Can peanut allergy return after my child has grown out of it? - Usually a child that has grown out of peanut allergy does not subsequently re-develop the allergy. 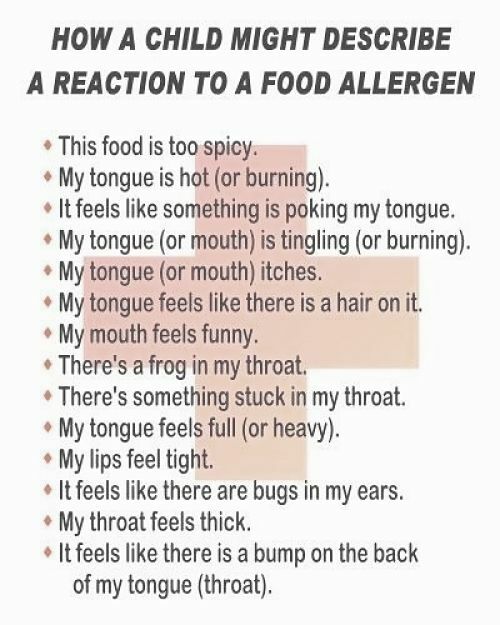 There are rare cases in which the allergy has returned. It is thought that the allergy may be more likely to return if peanuts and peanut products are totally avoided after the child has grown out of the allergy. For this reason your doctor may advise your child to consume some small amount of peanut products several times a week. Is my child likely to have a severe reaction from casual contact with peanut product on benches, other children's hands or by smelling peanuts? - No! Severe reactions from casual contact are extremely rare. Recent studies have shown that placing peanut butter on the skin did not cause any severe reactions in a group of peanut allergic children. But there is always the chance that the child my lick their skin or eat peanuts or their residues. There are no methods which can guarantee a child will not develop peanut allergy. There is no evidence that avoiding peanuts and peanut products in pregnancy or in the diet of lactating mothers prevents peanut allergy in their babies. There is some evidence that suggests that skin creams which contain peanut product may promote sensitisation. Recent publications have suggested that early introduction of peanut containing foods in infancy might even protect against the development of peanut allergy. Does peanut De-Sensitization Work and is it Worthwhile? The idea is to get the immune system to respond in ways other than creating an allergic reaction. It starts with a very low dose of the allergy-causing food, powdered and put into solution. It can also be dome with peanut protein extracts. If the child tolerates it in and observed trial under supervision, that dose is continued daily at home for two weeks. But the child need to remain quiet and avoid exercise for two hours after taking the product. Exercise can cause a small controlled dose to get into the bloodstream too quickly and this can cause a problem. Next, the child comes back to the doctor, and if everything has gone well, the dose is increased every two weeks. Eventually, the actual food is given and increased, sometimes up to 12 nuts a day. The whole process takes eight months, and is usually covered by insurance for the cost of the doctor and supervision. When they reach the eight month mark, the children have reached a maintenance dose and the allergy is under control. But the children have to eat this dose every day for several years. Careful monitoring is also required. Studies have shown that this process works 80 percent of the time. Some drop out because of stomach ache, rash, wheezing, or a bad reaction. Surprisingly, few if any cases of anaphyllaxis have happened at a doctor’s office during this treatment. It’s more likely to happen at home, with fever, too much exercise too soon, or just randomly. For that reason everyone should have an Epipen available at home. California-based Aimmune Therapeutics has found that 67 % of kids who had its experimental treatment were able to tolerate the equivalent of roughly two peanuts at the end of the study, compared to only 4 percent of others given a dummy powder. A recent study involved nearly 500 kids ages 4 to 17 with very severe allergies. They were given either capsules of peanut or a dummy powder in gradually increasing amounts for six months, then continued on that final level for another six months. Neither the participants nor their doctors knew who was getting what until the study ended. About 20 % of kids getting the peanut powder dropped out of the study, 12 % due to reactions or other problems. The drop-out rate is a problem and this emphasises the potential dangers. Some people are going to have too many side effects for them to be able to take this daily dose. Dr. Andrew Bird, an allergy specialist at UT Southwestern Medical Center in Dallas, warned that he treatment doesn't allow kids to eat peanuts as if they had no allergy. But research suggests that being able to tolerate at least one peanut should protect 95 percent of them from having a reaction if they are exposed accidentally to peanuts. Aimmune plans to seek U.S. Food and Drug Administration approval for the treatment later this year and in Europe in the coming years. Professor Mimi Tang, from the Murdoch Children's Research Institute, developed a treatment where kids with peanut allergies were given a probiotic called lactobacillus rhamnosus, with a peanut protein, once a day for 18 months. They found one month after stopping treatment, more than 80 per cent of children who received the protein and probiotic could tolerate peanuts without any allergic symptoms at the end of the trial. The same children were then tested four years later. Professor Tang said 70 per cent of the children were still able to eat peanuts without allergic reactions. "These findings suggest our treatment is effective in inducing long-term tolerance, up to four years after completing treatment and is safe," she said. "Two thirds of the treated participants were able to continue regular peanut ingestion and more than half were ingesting moderate-to-large amounts of peanuts on a regular basis." One of those that successfully took part in the study is 10-year-old Olivia May. She suffered an allergic reaction seven years ago while biting into a peanut butter sandwich. "We visited the allergist the first time [and] he said 'sorry, you're going to have to go home and empty your pantry out, clear it of all nuts, anything with nuts in it'," Olivia's mother Tanya May said. But today Olivia shows no signs of her allergy. "I think perhaps one of the best things has been to be able to just go to parties and I can drop her off or at a sleep over," Ms May said. "I used to hand over a EpiPen to a parent I'd hardly knew and give them a 30-second explanation how to use it. The idea behind the treatment is that the probiotic changes how the body's immune system responds to an allergen, in this case peanuts. "The probiotic acts on the immune system, encourages the immune system to generate a protective, or tolerance, response rather than allergy," Professor Tang said. "When given regularly over time, we hope to see the immune system recognise the antigen," she said. Food allergy occurs in about one in 20 children and in about two in 100 adults. According to the Australasian Society of Clinical Immunology and Allergy, the most common allergy triggers are egg, cow's milk, peanut, tree nuts, seafood, sesame, soy, fish and wheat. The majority of food allergies in children are not severe, and may be "outgrown" with time. But some, particularly peanut, tree nut, seed and seafood tend to be lifelong allergies. Some food allergies can be severe, causing a life-threatening reaction, known as anaphylaxis. Researchers from the Murdoch Children's Research Institute said larger studies of the probiotic peanut protein treatment were needed to assess long-term safety outcomes. It is also running a trial seeing whether children can overcome peanut allergies by simply taking the probiotic or whether the peanut protein is needed as well.